This USB 3.0 DVD drive burner provides you with faster data transfer speed. This device is the perfect addition to most computer that doesn't contain internal disc drive. This universal DVD/CD drive can be used to watch dvd's, copy files/ movies to disc, install software and create backup discs etc. * Speed: 8X DVD+R, 8X DVD-R, 8X DVD+RW, 6X DVD-RW,6X DVD+R Dual Layer, 6X DVD-R Dual Layer, 6X DVD-RAM, 5X CD-R, 24X CD-RW. 4. Before you using the CD-ROM drive, make sure your computer has a"Media Player". Customer's using Windows 10 are advised to Install VLC Media player to Play DVD and CD. Risk free for 1 Year Limited Guarantee. You can enjoy refund or replacement without condition in 12 months from the purchase date. Please contact JIRVY Customer Support first if you have any questions. 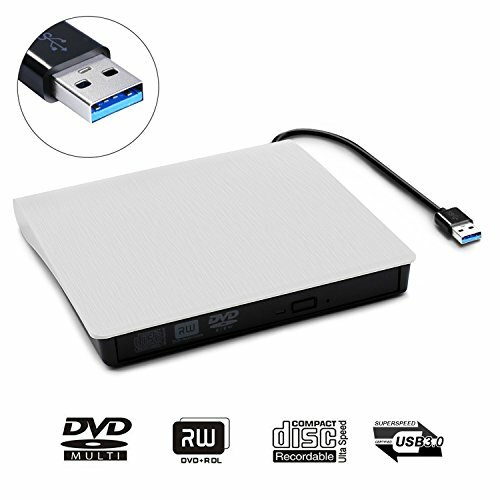 【USB 3.0 Interface】: The DVD-RW drive and the USB cable are combined in one. Embedded USB cable design, easy for storage.Using advanced USB3.0 technology, this portable CD DVD drive provides you high speed data transfer and more stable performance, while being backwards compatible with USB 2.0 and USB 1.0. 【Unique Burning Technology】: Adopted unique intelligent burning technology, you can burn your disc or interrupt recording at your ease. Pop-up button and disc tray design makes it convenient to read or write discs. 【High Perfermance】: This USB external DVD burner features strong error-correcting ability, anti-shock and noise reduction technology, low power consumption.With voltage stabilization system, CD drive can avoid work breakdown or damage to computer because of high or low voltage. 【Wide Compatibility】: DVD player for laptop compatible with Windows XP / 2003 / Vita/ 7/ 8.1/10, Linux, Mac OS system. 【Easy to Use】: The external burner powered by the USB port. Plug and play, no need to install any drive program. If you have any questions about this product by JIRVY, contact us by completing and submitting the form below. If you are looking for a specif part number, please include it with your message.